The news media regularly covers this program. Articles about wild horses appear daily, in fact. So why is the public incensed over the U.S. Department of Agriculture’s Meat Animal Research Center while the WHB program goes ignored? 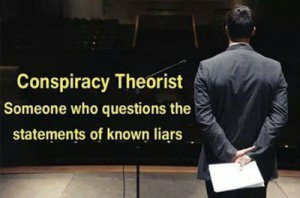 If Moss, in his reporting on the Meat Animal Research Center, had turned to the USDA’s web site and livestock producers to ask about doing research to boost industry profits, would anyone ever know about “easy-care sheep” and lambs left to perish in rainstorms courtesy of unknowing taxpayers? Of course not. But coverage of the WHB program was dominated by those groups making money off it. David Philipps’ New York Times article (“As Wild Horses Overrun the West, Ranchers Fear Land Will Be Gobbled Up,” critiqued here) and Caty Enders’ Guardian piece (“Why You Really Should, But Really Can’t, Eat Horsemeat”) are two cases in point. Non-industry sources comprise less than 8 percent of the articles’ collective text. The other 92 percent is all industry boilerplate. Enders’ loyalty to the ranchers’ perspective even creeps into her word choices. Notably, she uses rancher lingo to refer to wild horses, calling them “feral.” Her point of view is clear, and it’s 92% bull. An over-reliance on federal and industry sources is problematic not just for animals, but for the consumers who eat them (and care about their welfare). Enders’ piece notably fails to answer the two questions posed in her own headline: a) why you should eat horse meat, and b) why you can’t. One reason why you can’t eat horse meat is that some states ban it outright. The larger reason is that Congress passed an amendment banning inspections in horse slaughter plants, preventing them from opening. These facts are well documented in the media, as this January 17, 2014 NPR article exemplifies. Enders’ suggestion that wild horses would be suitable alternatives is equally misinformed. For one thing, wild horses in BLM holding facilities are wormed and vaccinated (therefore not free of drugs banned in meat animals). For another, Congress prohibits the slaughter of wild horses. As a reporter, Enders should have known that, too. Why did she not? Simple: industry, whom she relied on for her reporting, doesn’t offer this information. The only place you’ll learn about the intricacies of horse slaughter (and wild horse round-ups) is from advocacy groups: the very people Enders and Philipps gave one word of text to for every eleven it handed to ranchers and the BLM. There’s a reason why complex topics — such as Moss’ investigation into the Meat Animal Research Center and wild horses rounded up by the BLM — require thoughtful digging and reporting. The alternative — an easy reliance on self-interested federal and industry sources — keeps the public in the dark about the inept, incomprehensible and inhumane things that the government is doing with its money. Journalists should not be abetting that corruption. They should be exposing it. Well known Nevada Kill Buyer ships 224 Stallions to Dennis Chavez! Animals’ Angels has received confirmation that on January 15, 2015, Ole Olson transported 224 stallions to the New Mexico’s largest and most notorious kill buyer Dennis Chavez. 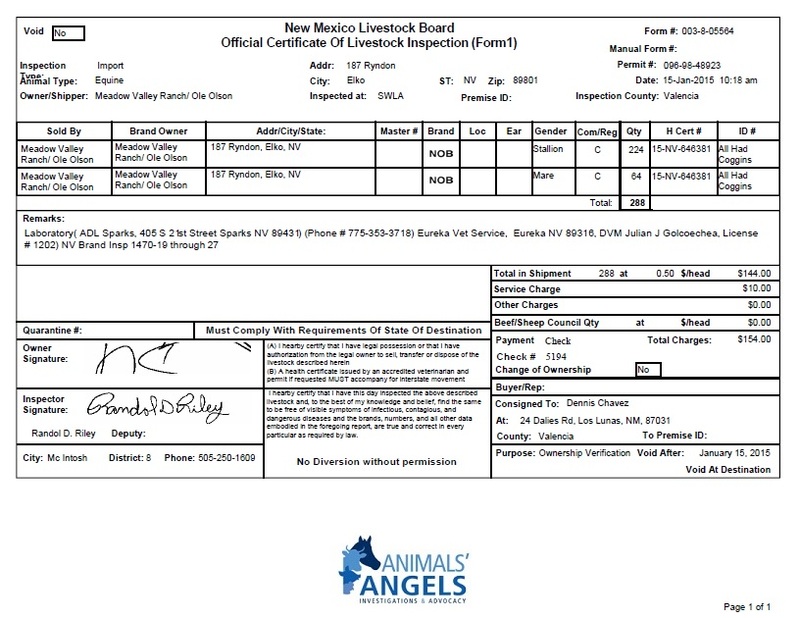 Records obtained from the New Mexico Livestock Board indicate that the agency inspected the 224 stallions and 64 mares at the Los Lunas Feedlot. While it cannot be confirmed that these horses are indeed a part of the Dann Sister herd, it is possible. However, regardless of the origin of these horses, it is important to question how these stallions were shipped. The Commercial Transport of Equines to Slaughter Regulations require that every stallion is segregated inside the trailer to avoid fighting and the risk of injuries. Given the fact that Olson shipped 224 stallions, it is unlikely that this requirement has been met. One can only imagine the chaos inside the trailers with so many stallions packed together fighting for dominance. The risks for injury during slaughter horse transport is always great but given the sheer number of stallions Olson was transporting, the danger for grave and debilitating injuries, not to mention the horrific distress, would have been tremendous.According to the New Mexico Livestock Board’s inspection form, the horses were consigned to Dennis Chavez – we’re all too familiar with his operation, so we know where these horses are potentially headed and the conditions under which they may suffer at his feedlot. 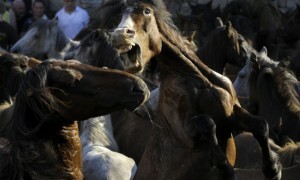 While the horses may be sold at his auction, it is also possible that they will end up in Mexico. It remains to be seen if Chavez will trouble himself with gelding the stallions (a requirement if he wanted to export them as slaughter horses), or if he will ship them straight to Mexico labeled as “work horses”.AA investigators have seen the sad results of Chavez’ clumsy gelding procedures during previous feedlot visits; yet another reason our heart goes out to these poor souls caught in the pipeline. While we continue to keep an eye on Dennis Chavez and his Southwest Livestock Auction for abuses that can be reported to the authorities, we are also going to take measures to hold Ole Olson accountable for the recent shipments. Animals’ Angels has filed a complaint with the USDA and has urged IES to launch an investigation into the true purpose of these transports and the final destination for these stallions.